We’ve been having a great time with Science 2 from Nancy Larson Science. Earlier this month, I shared with you “what’s in the box” to give you a sneak peak at this program. Nancy Larson Science for Homeschool is a complete, secular science program. This means that when you purchase Nancy Larson Science, not only do you receive the teacher and student materials, you also get a “Tool Kit” with the materials you need for the lessons, Picture Cards, and addition resources on CD for your lessons. Everything is there, ready to go, out of the box. While it is recommended for students ages 7-9, it can also be used for older students with limited science experience. I received an additional reading list from Nancy Larson Science which gave me many ideas to expand on the ideas in the lessons. This list could be used with older students to help them dig a little deeper into the subjects. The flexibility of this program makes it easy to use it across multiple grade levels. It’s easy to purchase extra Individual Student Units (extra copies of the student materials) so all your children can use the same program. I am combining Mr. Man and Bug (Kindergarten and Third Grade) using Science 2 with good results. This program is very much “open and go.” I look over the next lesson for me to teach while Bug and Mr. Man work on the review pages, so I can get an idea of what items I need to gather and what I am going to be teaching the next day. The Teacher’s Manual starts with a box for “Lesson Preparation” which outlines everything you need to teach. The program materials and Tool Kit Items are all included in your box. Collected items are things you’ll need to find around the house. This list is never very long, and I have yet to come across a material I didn’t have. Everything is common items, so when I read the lesson, I just quickly grab the things I need, throw them in a ziplock, and stick that in my science box which holds all my Nancy Larson Science 2 materials. When it comes time to teach the lesson, Nancy Larson couldn’t have made it easier. The lessons are scripted, which means everything you need to say and do is spelled out for you in the manual. You can use these lesson plans verbatim, by reading the boldfaced words, and preforming the bulleted actions. If you want, you can also read ahead and paraphrase the lesson. I personally like the scripted lesson plans, because they give me a good idea of how I can steer the conversation with my kiddos while teaching the lesson, and what kind of responses I am looking for from my children. I don’t always read straight from the lesson, oftentimes I will read a section to myself, and use it as a guide with the kids. If I feel the conversation going off topic, then I come back to the script. It is a wonderful tool to keep us all focused, and to help me know what and how to teach. Most of the lessons include a hands on element which has your child exploring the different topics in a way they will remember. You won’t just talk about buoyancy, you’ll test different objects from around the house to see if they float. What I really like about the hands on lessons is that they aren’t big, complicated experiments. Nothing takes long to do, or makes a large mess. 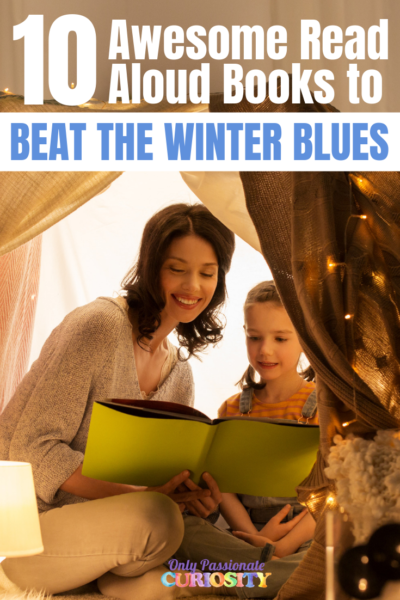 The activities are purposeful, and designed in a way to teach a lot, without causing a headache for Mom. I get overwhelmed with too many “big” projects to do, and Nancy Larson Science doesn’t overwhelm me. I love that I am not wasting my time on a big set up for a 5 second demonstration, and I love that most of the hands-on discovery is done by the kids, instead of demonstrated by me. Nancy Larson doesn’t use a textbook. Instead, you have student produced booklets which your child will really enjoy making! 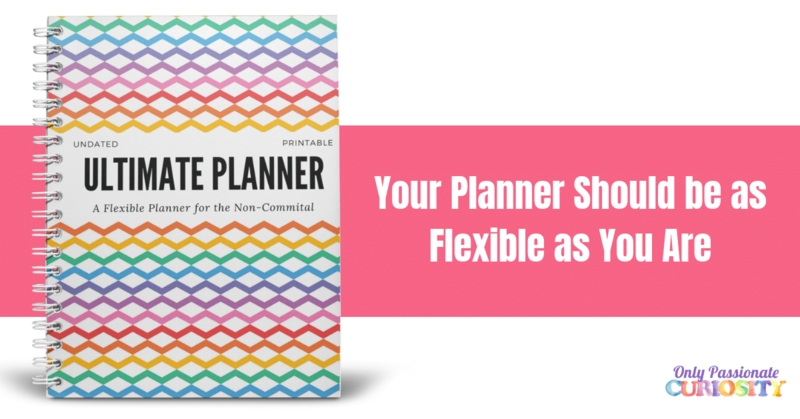 When I am looking at new curriculum, I want to be able to hold it in my hands and flip through it before buying. Since I can’t invite you over to see this part of the program in the flesh, I decided to try something new and give you a video look at the student materials. The lay out of these are great, because as I showed you before, it’s entirely child-led. They illustrate it themselves, add in found objects, and are taught specifically how to highlight and read for important information. If you don’t want to watch the video above, I showed you the student booklets, and the review worksheets in depth. The booklets contain the reading for the programs, which you are directed to use in your teachers materials. The reading is done either by the teacher with the student following along, or, like we do in our house, the student can read the materials aloud as you discuss. The review worksheets are done after the lesson, and include a “looking back” section which helps keep prior knowledge fresh as they work through the program. There are 80 lessons in Science 2. Each lesson also includes a review, which can be done on the same day as the lesson, or on a different day. This means the program is set up so you can easily pace it. If you do a 40 week school year, you can either do science twice a week (doing the review on the same day as the lesson) or you can do science four times a week, and do the lessons and reviews on alternating days. This is how we decided to use the program, I teach on Monday and Wednesday, and the kids do the review on Tuesday and Thursday. I have to say, it absolutely is. This program is well set up, and complete. It’s “open and go” which means that science gets done on a regular basis without hassle. I have not seen a science program as well set up as this one before. When I get ready to teach, all I need to do is open my teachers manual, check the list of supplies, grab them out of the science box, and go. I compared prices to some of the other complete science programs out there, and Nancy Larson is comparable to many programs on the market. You get what you pay for, and in this case, you are paying for an easy to use, complete program that will not end up sitting on your shelf collecting dust. This is a very well put together program. Science has never been easier for us, and since starting Nancy Larson Science, we have been consistent with science class. I am impressed with the content of the Science 2 program. The vocabulary words are well thought out, and so much content is covered. I am also impressed that it is teaching reading and study skills along with science. Nancy Larson Science 2 taught Bug how to highlight his reading, and read for content, which he is now doing with reading passages in Language Arts. 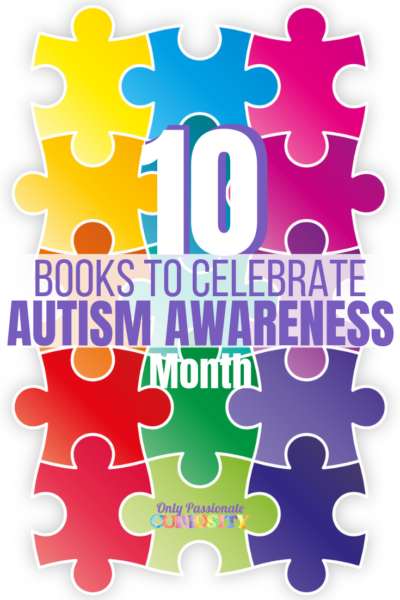 His comprehension is improving as he is slowing down to read for content. 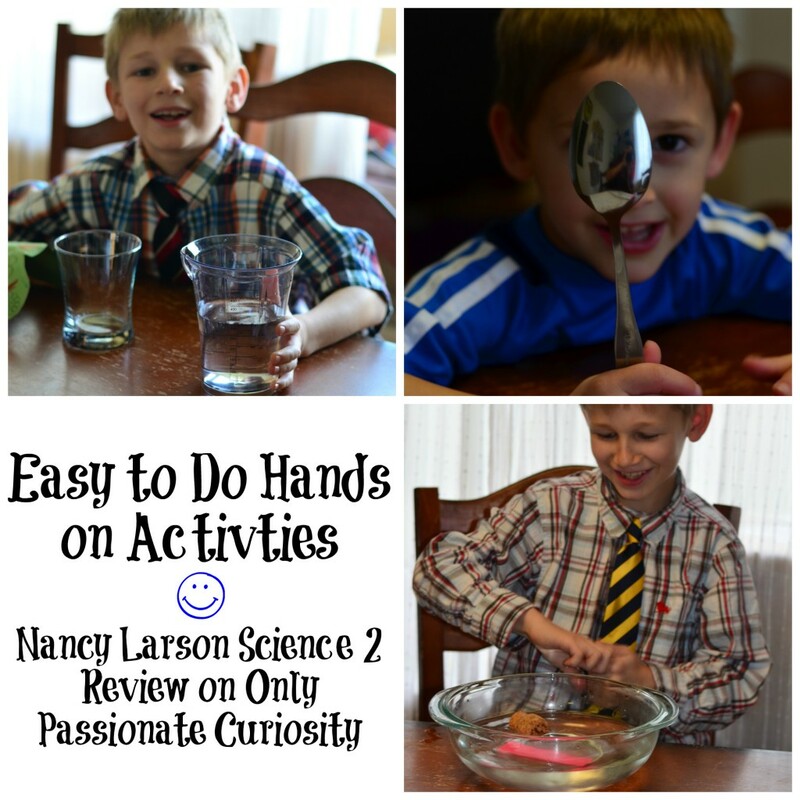 It’s a wonderful added benefit from Nancy Larson Science 2. Not only am I happy with this program, Bug and Mr. Man are having a wonderful time with it. They ask every day when we are going to do Science, and beg to do it first. They love the hands on activities, and love “being scientists.” Both are very proud of the work they have put into their student booklets, and Bug has even pulled his out to show friends when they come over. I love that they love Nancy Larson Science. 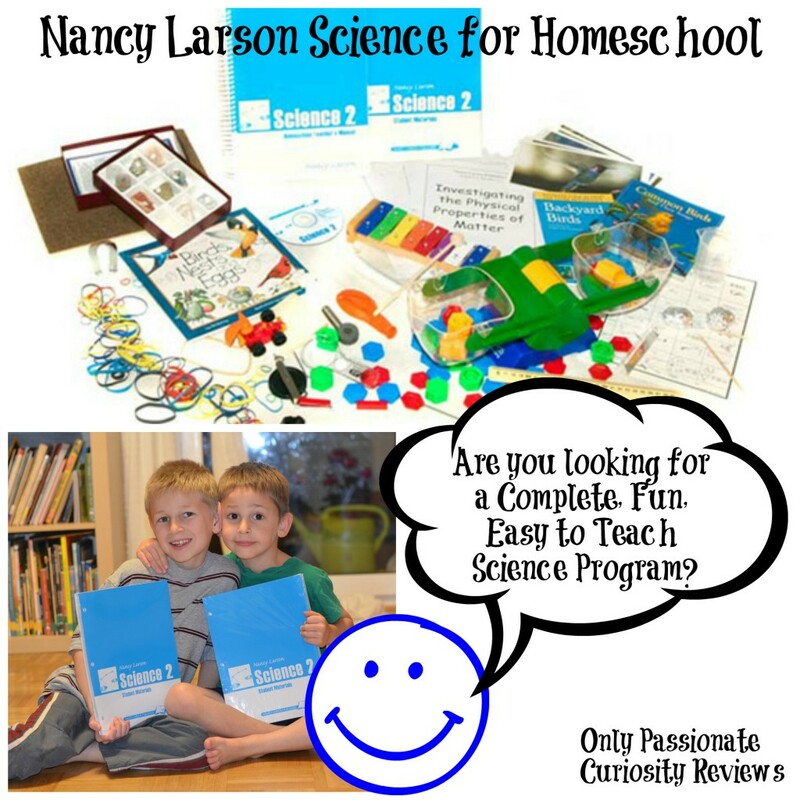 Nancy Larson Science for Homeschool has 5 levels, Kindergarten, Science 1-4. All levels are secular and complete. Science 2 is appropriate for kids ages 7-9 and older students with little science exposure. 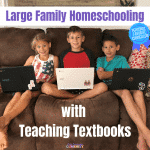 The Tool Kit includes most of the materials needed to use the program, and you’ll only need to gather a few common household supplies before each lesson. The lessons are scripted, and come with student booklets which include all the reading for the program and interactive elements, like collecting items, and illustrating concepts. 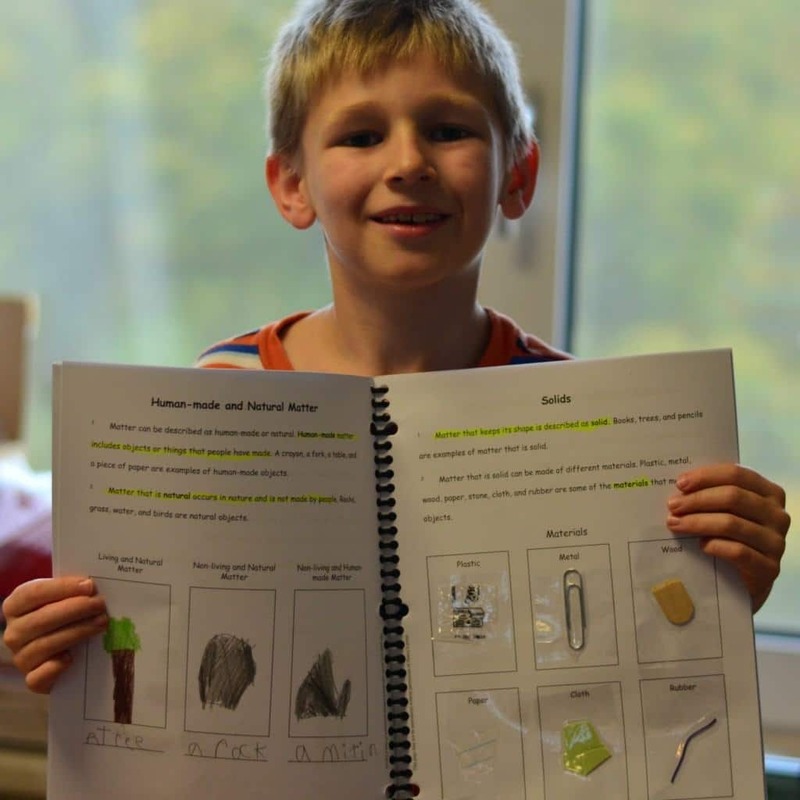 In addition to the student booklets, Nancy Larson Science includes review pages and assessments which help your child keep important information fresh as they progress in the program. I *highly* recommend this program for anyone looking for “open and go” science that is complete, secular, and FUN! Great review! We have used all four levels of NLS and I think I have to be their biggest fan. I share my love for her products whenever I can. I love the simplicity of the program! And I know that without a doubt, my children are learning a lot thru these lessons. I must admit I am learning too! Thanks to NLS, my kids love Science!